In the 1970s, when the US was fighting in Vietnam, the communist government of Albania created some of the funniest propaganda slogans. One said: “Mbahu Vietnam” – Hold on Vietnam. Another said “Vietnam, nuk je vetëm” – Vietnam, you are not alone. It is not known if any Vietnamese was ever encouraged by this solidarity shown by its communist brothers far away from the theatre of war. Dictatorships often use fear from unknown internal or external enemies to facilitate their rule. Government officials and party leaders urged the population to write such slogans everywhere, from Tirana to the humblest village. In 2001, a short movie was produced showing the process of writing slogans in a village. In the movie, farmers are urged to write the slogans because their village will be visited by a very important party official. Eventually, the party official’s car passes the village without even stopping there. Surely, not all Albanians were convinced by these slogans. Indeed, among many slogans invented by the propaganda machine of that time, those two were singled out as the funniest. They are still used today. Few weeks ago, an environmentalist movement that strives for higher use of bicycles in Tirana and more bicycle lanes, wrote in a placard: “Amsterdam, you are not alone”. And lately, when Albanian Police stormed the notorious cannabis plantations in Lazarat village, those two slogans surfaced again on Facebook. “Intelektuhalet”, (rough translation “intellectuals and toilets”) a Facebook page that satirizes intellectual thinking, transformed the Communist era slogan in “Mbahu Lazarat” – Hold on Lazarat. 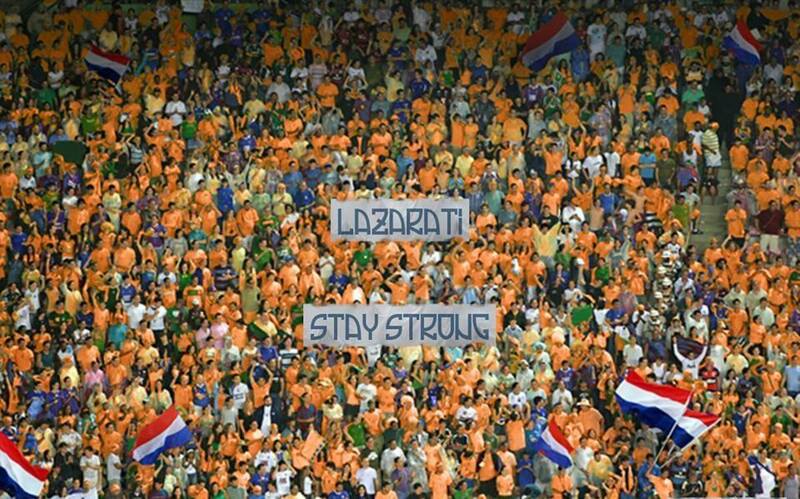 Another Facebook user manipulated a photo of Dutch soccer fans from the Brasil 2014 tournament adding to it a large banner which reads: “Lazarat, Stay Strong”. Rough translation in English seems to have been intentional. This photo took Albanian Facebook users by storm and, was shared extensively eventually reaching the conventional media.